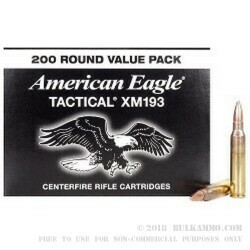 With all the .223 ammunition on the market how do you decide which one is for you? 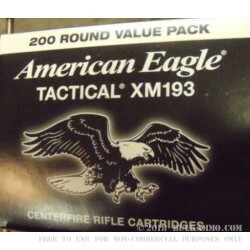 The proven performance of the XM193 is a good place to start for a general purpose round as it has proven its statue in military use (the specifications, not the actual round) and so closely mimics its sister cartridge the M193 (which is among the most proven military rounds in history) that most other civilian available rounds can’t even hold a candle to it. The X/M/193 specification generally calls for a centerfire cartridge with a 55 grain full metal gilded jacket projectile with a lead core makeup and a specific powder charge. This charge in the XM193 happens to push this 55 grain FMJ out of the barrel at 3240 feet per second velocity and offers 1282 pound feet of energy delivery at the muzzle. The 55 grain projectile shoots very well out of the midrange of the barrel twist offerings available on the broad market and, while it will certainly shoot out of the other twist rates it won’t be as accurate. This projectile thrives in the 1 in 8 inches twist rate; the 1 in 9 inches twist rater; and the 1 in 10 inch twist rate.